Model S600 Multi-Channel Test System combines a wide range of configuration options with extremely fast test speeds to deliver the lowest unit-cost-of-test for high-volume power conversion devices such as AC-DC power supplies, adapters, chargers, LED power drivers, DC converters, and voltage regulator modules. 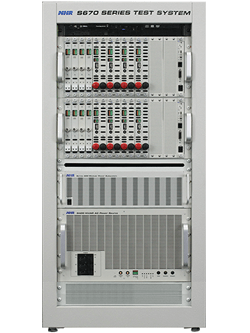 S600s may be configured to efficiently test anything between a single supply with as many as 16 outputs, 16 separate single-output supplies or any combination of supplies and outputs between those two limits. * includes 2” casters, 2 U reserved for internal wiring.